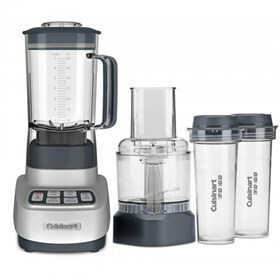 The Cuisinart BFP-650 velocity ultra trio blender/food processor with travel cups features a heavy-duty 1 horsepower motor to deliver quick, thorough results. It has electronic touch-pad controls with LED indicators that is high, low, pulse, pre-programmed smoothie and ice crush controls. This combo is the cornerstone of the kitchen, tackling anything thrown its way. The BFP-650 comes with a 3-cup food processor attachment with feed tube and pusher.The blender's large 56-oz. BPA-free Tritan plastic jar comes equipped with a drip-free spout and Patented ultra-sharp stainless steel blade. The Trio Blender/Food Processor W/ Travel Cups has many exciting features for users of all types. You can extend the lifetime of your Trio Blender/Food Processor W/ Travel Cups with the purchase of a FactoryOutletStore Factory Protection Plan. See the Trio Blender/Food Processor W/ Travel Cups gallery images above for more product views. The Trio Blender/Food Processor W/ Travel Cups is sold as a Brand New Unopened Item.